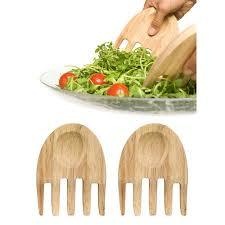 Handy Salad Hands utensil set from Sagaform. This set of 2 ergonomically designed oak salad utensils are perfect for serving and tossing salads at the table. Use them at your next dinner party or give them as a gift to the hostess!